Peerless Premier LP natural gas propane stoves now in stainless steel? * All these gas ranges come set up for natural gas, but everything is included to easily convert these ranges for propane use. In addition to the "glow bar" ranges, Peerless-Premier also manufactures thermocouple spark ignition and battery spark ignition ranges. Click here for more information. Note from the manufacturer: Constant improvements make changes without notices a necessity. Gas ranges may not exactly be alternate energy, but many of our customers cannot find a high quality gas stove that does not need a lot of power to operate. Most new gas ovens have a "glow bar" that draws 300 to 400 watts of power the entire time the oven is on--quite a big battery drain! This is a safety feature that makes certain the flame does not go out and prevents the oven from being used in the event of a power outage. If you don't want pilot lights burning, buy a range with spark (electronic) ignition (which only uses 2 watts for a few seconds). With these kinds of stoves, pilots will light automatically if 120VAC is connected. Without AC power, all burners and the oven can be lit with a match--the old fashioned way! Click the following link to view manual operation without power. These high quality, American made ranges ship from Belleville, IL; please allow four to six weeks for delivery. Most white and stainless steel ranges are in stock, black and almond will usually take longer, with a maximum of 5 to 6 week lead time. and are AGA and CGA approved. The oven is full size and offers extra capacity; it's completely insulated, saving energy and makes for better baking. The baffled oven burner disperses heat uniformly; the lift-off oven door (except in 20" units) allows easy access for cleaning. The oven racks are nickel-coated for durability; the oven door seals retain heat in the oven; and the removable oven bottom provides a recessed area to retain spills. The broiler offers a roll-out drop door for easy access, with a positive closed position, and the large pan and tray have an all-porcelain finish. OPTIONS: Chrome heat reflector trays can be ordered separately when not included with the model number. Universal valves on all models allow for easy conversion from Natural to LP gas without additional parts or special tools. More porcelain enamel parts enhances the value and life of your range; are easiest to clean, and resist scratches and stains. The lift-off cook top allows access to the porcelain burner box and the individual removable top burners for easy cleaning. 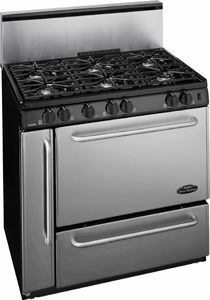 Other standard features include: lifetime guaranteed top burner elements; recessed porcelain lift-up cook top with support rod; up- front controls; blade type burner knobs; permanent markings on control panel inlay; surface indicator light; oven indicator light on 30" units; oven limit switch; keep warm 150�F oven thermostat; closed door variable broil; color coordinated door handles; silicone oven door seals; fully insulated (blanket type); porcelain smokeless broiler pan & tray; four leg levelers; and heavy duty rigid construction. Pricing is as listed (for white units) with the following options extra: For chrome reflector pans, add $20 for an open burner set (part # CBB) of 4. White units are generally in stock, but there may be a 4 to 6 week lead time on certain models or non-white colors. Call for your freight costs on these fine units. Units ship via truck freight from Illinois. A $25 crating fee is included in the freight quote. Options include DC battery based or AC electronic (spark) ignition; solid oven door versus windowed oven door; black porcelain oven door. Backguard, options include 4" porcelain; 4" stainless steel; 8" porcelain w/ electronic clock; 10" tempered glass with electronic clock; 10" decorative glass; 10" decorative glass with battery clock/timer. The 30" and 36" models offer griddle and 5th burner packages; and the 36" model offers 4, 5, or 6 burners. Colors available are white (no additional charge), black or bisque. The more options you get, the more costly the unit becomes, but the reverse is true. A plain version of the 30" unit, for example, white with four burners, electronic ignition, and 4" porcelain backguard is $489 before freight. Note: the models listed on our pictures page are what this manufacturer offers; you can't necessarily mix and match options--what you see is what you get! But, there is a great variety in the models offered. We've got some nice pictures of these units; let us know the size you need (20", 24", 30" or 36") and we'll mail you additional information to help you ascertain what options best suit your kitchen. White units are generally in stock; almond or black may take longer. Call for your freight costs on these nice, long-lasting gas ranges! See what our customers have to say about these propane and natural gas stoves. WHAT TRUCK FREIGHT ENTAILS: The best rate for truck freight shipping is to have you pick it up at the local freight terminal or commercial drop point. Does not include a lift gate, inside delivery, delivery above a first floor, etc. Call for pricing and freight on any of our truck freight items!